This homemade almond milk recipe is a great non-dairy milk option if you're sensitive to dairy or vegan. I like to use homemade almond milk because the store-bought kind usually has additives that can be harmful and it usually has a lot of added sugar. This homemade almond milk recipe is a great non-dairy milk option if you’re sensitive to dairy or vegan. 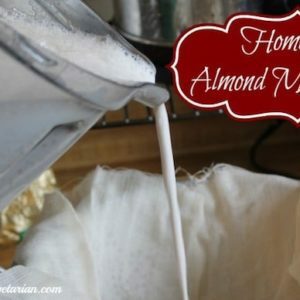 I like to use homemade almond milk because the store-bought kind usually has additives that can be harmful and it usually has a lot of added sugar. 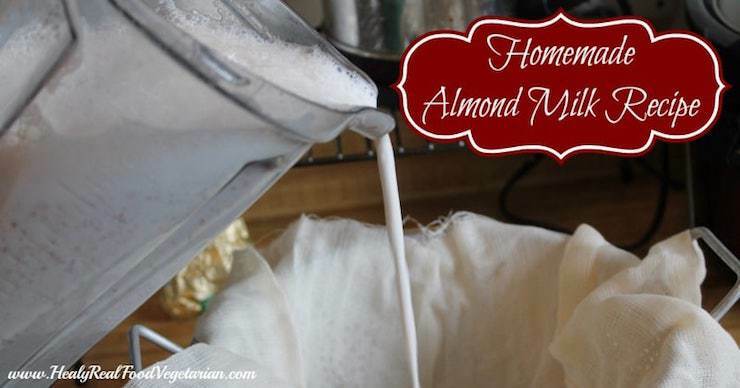 This homemade almond milk recipe is not very hard to make once you get the hang of it! I like to make a big batch a freeze a few jars of milk for easy access later. This is great to use as a delicious beverage on it’s own or to use in a smoothie or hot cocoa! Soak raw almonds overnight or at least 8 hours. Cover almonds with filtered water and make sure there is a few inches of water over the almonds. They will expand as they soak. They must be fully submerged in water. After the almonds have soaked, drain the water out. Put the almonds in a blender and pour 2 cups of fresh water over the almonds. Blend on high for a couple minutes. The mixture will be white and resemble milk. 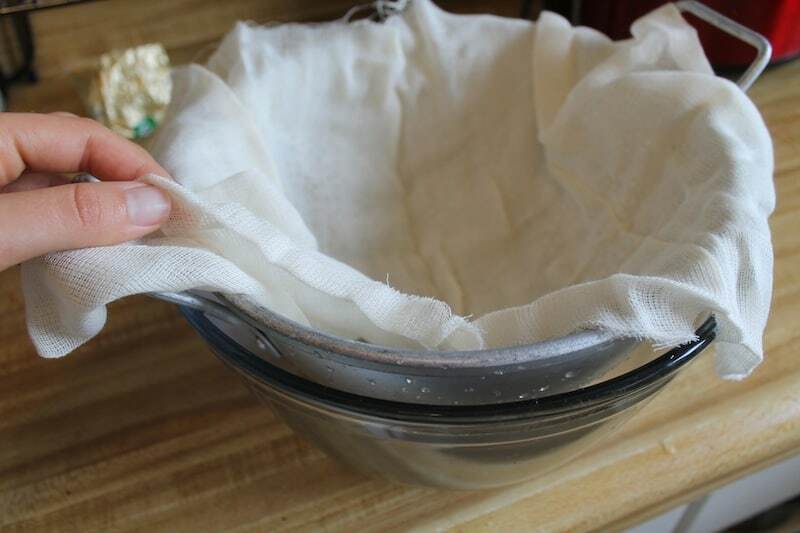 Place a colander or strainer over a large bowl and cover the strainer with cheese cloth. 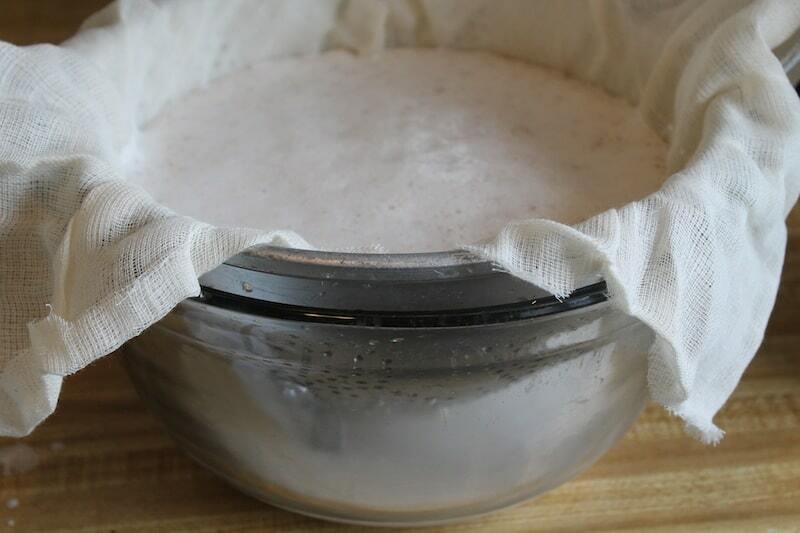 Pour the almond/water mixture over the colander lined with cheesecloth. This will strain out the almond milk from the almond meal. 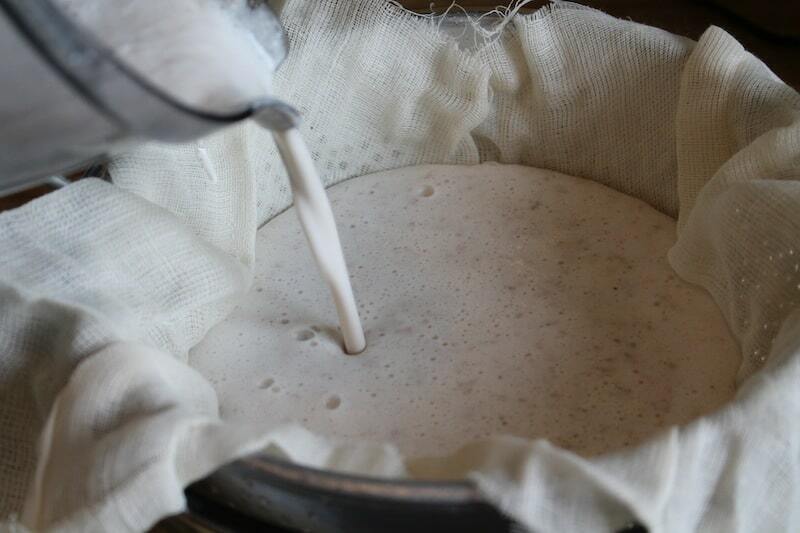 Let the milk drain from the mixture. 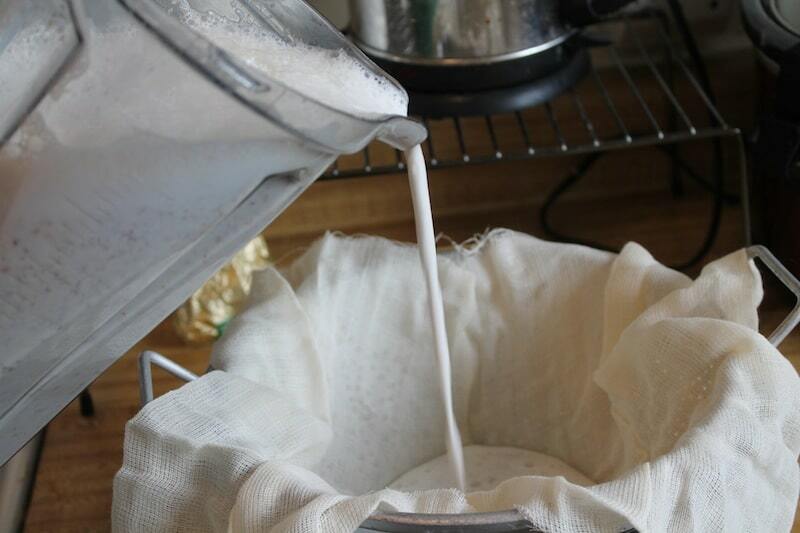 To speed along the process, you can pick up all four corners of the cheesecloth and squeeze out any excess liquid out of the almond meal. The resulting liquid is almond milk. It can be a little bitter, so you can add vanilla, sweetener and a pinch of salt to it to make it sweeter. I usually put the almond milk into jars, then add the sweetener and vanilla and shake the closed jars to mix it all together. Make sure that you use the almond milk within about 5 days or it will go bad. If you don’t plan on using all of the almond milk within 5 days, you can freeze a portion of it for later use. If you freeze it in jars make sure you leave at least 2 inches of room between the top of the jar and the almond milk so the jar doesn’t break when expanding in the freezer. NOTE: You can save the resulting almond meal and use it for baking. Just dehydrate the almond meal at about 135° for about 1-2 days or on your oven's lowest setting for one day until dry and it will be good to use for baking any recipe that calls for almond meal. To make the dehydrated almond meal more powdery after drying, run it in a food processor for a minute or two. 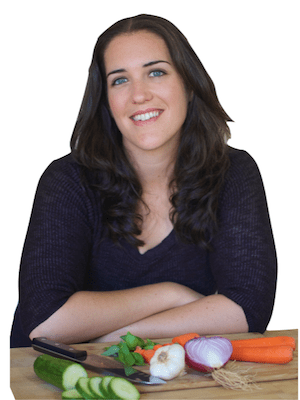 This is the best, most practical recipe for almond milk that I have found? thank you. 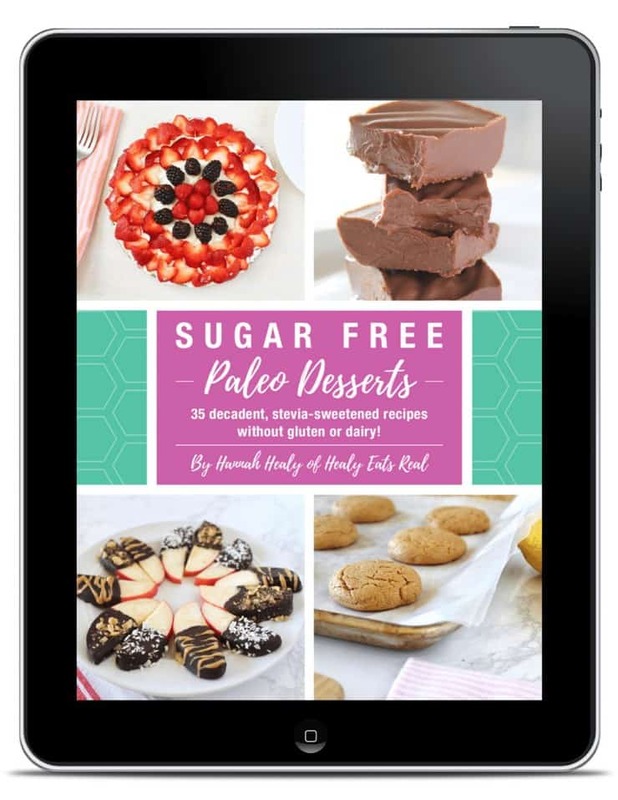 What does it mean when you say in the recipe, “dehydrate the almond meal on X for about 1-2 days”?